St. Vincent was born in Pouy, Landes, Gascony, France, to a family of peasant farmers. He had four brothers and two sisters. He studied humanities in Dax, France, with the Cordeliers and he graduated in theology at Toulouse. 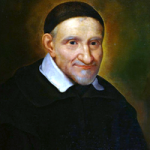 He was ordained in 1600, remaining in Toulouse until he went to Marseille for an inheritance. In 1605, on his way back from Marseille, he was taken captive by Turkish pirates, who brought him to Tunis and sold him into slavery. 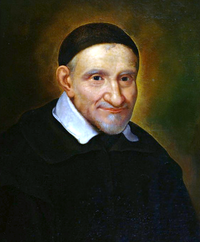 After converting his owner to Christianity, Vincent de Paul escaped in 1607. After returning to France, de Paul went to Rome. There he continued his studies until 1609, when he was sent back to France on a mission to Henry IV of France; he served as chaplain to Marguerite de Valois. For a while he was parish priest at Clichy, but from 1612 he began to serve the Gondi, an illustrious family. He was confessor and spiritual director to Madame de Gondi, and he began giving preaching missions to the peasants on the estate with her aid. In 1622 de Paul was appointed chaplain to the galleys, and in this capacity he gave missions for the galley-slaves. In 1625 de Paul founded the Congregation of the Mission, a society of missionary priests commonly known as the Vincentians or Lazarists. In 1633, with the assistance of Louise de Marillac he founded the Daughters of Charity. He also fought against the Jansenist heresy. De Paul was renowned for his compassion, humility and generosity. For this reason he is known as the "Great Apostle of Charity".